Acquiring the property Title Deed. When a sale takes place, the transfer of property ownership is a simple procedure which can be done through the Cyprus Land Registry Office. It is usually done in person, or by someone who has on his hands Power of Attorney (a lawyer). The Council of Ministers’ permission is required for all foreign property purchases; also any foreign purchasers have to provide evidence of the foreign exchange transaction. This is a formality and does not present a problem to respectable foreign property buyers. The contract of sale must be in writing, and to protect the buyer’s rights to the property, the contract needs to be registered at the District Land Registry office within sixty days from the contract date. The new title deed will be registered in the name of the buyer and recorded in the Government archive. Transfer fee is calculated in the same way as in transactions on the secondary property market, i.e. every time the real estate title is transferred from one owner to another. The registered owner of the property is liable to an annual immovable property tax calculated on the market value of the property as at 1st January 1980. The amount of tax you will pay is calculated by the Inland Revenue Office and will be based on the 1980 value of the home and on the names on the “Certificate of Registration of Immovable Property.” Properties valued at less than €12,500 are exempt. 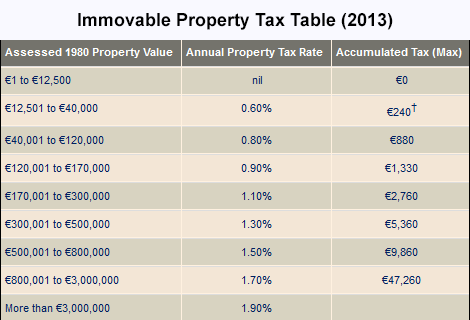 For example, if a property is in one name and has a value of €60,000 you would pay 0.6 % on the first €40,000 =€ 240. Then 0.8% on the remaining €20,000 = €160 to Total € 400. If the same property is registered in two names then the payment will be calculated on half the 1980 value. Stamp duty is paid only once within 30 days from the date of co-signing of the property acquisition contract in Cyprus in order to register the transaction in the Inland Revenue Department. Stamp duty for property purchase in Cyprus constitutes 0.15% when the overall cost is not exceeding €170860 and 0, 2% when the amount exceeds€170860. Therefore, while buying property in Cyprus you pay two types of taxes – Transfer Fee (tax on transfer of the ownership right) and Stamp Duty. Lump-sum payments related to the transfer or sale of immobile property. If you decide to sell your property in Cyprus you are entitled to pay Capital gains Tax, i.e. 20% of the profit moreover capital gains tax is levied at a fixed rate of 20% on both individuals and companies on gains arising from the sale of immovable property situated in Cyprus. If the seller was using the real estate he or she decide to sell, for over 5 years and it was the first time he or she sold property in Cyprus, the first € 85,430 is exempt from the Capital Gains Tax. Life Time Exemptions are exemptions apply only for individual (not for legal person) and are used for reducing / eliminating the taxable gain. For those buildings for which an application for a town planning permit was submitted prior to the 1.5.2004 and for transfers of plots or land, no V.A.T. is charged in the event of an acquisition. For those after the above date, a V.A.T. of 18% is charged (since January 2013), but only once. So if you acquire a property for which V.A.T has been paid previously you will not be required to pay V.A.T. again. V.A.T is not added on the sales price for the purposes of calculating the property transfer fees. Starting January 13, 2014 the new standard VAT rate in Cyprus is increased from previous 18% to 19%. Local authorities charge between €85 – €256 per annum (depending on size of your property) for regular refuse collection, street lighting, sewerage and similar community services. Communal Services fees are payable to your local Municipal authority.